I love the sound of cicadas in the summer. It is the tell-tale sign that it’s August. 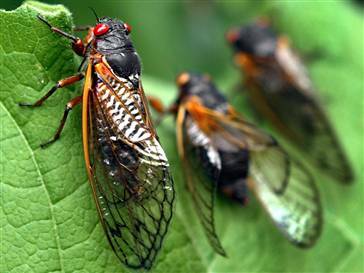 The cicada’s song is a mating call, but doesn’t sound that romantic to the human ear. If anything, it can be described, according to entomologist Gaye Williams, as “a million baby rattles.” But it is a sound that evokes in me summers spent outdoors under sunny skies up and down the Eastern seaboard. There’s nothing like a hot, sticky day, a slow breeze on the skin, and the loud call of the cicadas in the afternoon and evening, resonating and ringing. I don’t care much for the look of them, however. These are big bugs. Long, wide wings—they molt and leave behind a scary looking exoskeleton, and did I mention that they’re huge? Thank goodness their song is to attract one another and not to make themselves more endearing to us. I’m content simply listening to them, but from a distance. I find their drone to be comforting, lulling. But once I consider what’s making these sounds and what they look like, I get a bit squeamish. This evening, we began our worship with a very different sound—that of the shofar—the ancient ram’s horn, reminding us of the test of Abraham, of how he was called to raise his son up as a sacrifice to God, and how at the last moment an angel stopped Abraham and told Abraham to sacrifice an animal in lieu of a human. The shofar’s usage transcends this memory in biblical history. It was sounded in times of war; it was used for processions, and even as a musical instrument to praise the Divine. Its sound is animal, base, unrefined. It can be stirring, triumphant, mournful, or grand. But the most important part of the blowing of the shofar for us today as it has been for centuries is that we not only listen to the sound, but respond to it. Tonight, we begin the Jewish month of Elul, the month immediately preceding the High Holy Days of Rosh Hahshanah, the New Year, and Yom Kippur, the Day of Atonement. Elul is probably one of the most important months of the Jewish year. In looking ahead to the New Year, we need to be mindful of the prayers of those most Holy of days—for on those days we might be thankful for all the gifts of life and family with which we are blessed, but we also must be conscious of the hurt and pain we might have caused, either intentionally or accidentally, that have driven wedges between us and those we care about. If we show up on Rosh Hashanah or Yom Kippur to the synagogue not having prepared our souls, our minds, our hearts to this end, what chance do we have? We are asleep. For many, the summer is a spiritual snooze button on the alarm clock that beats within. I can relate to that. School is out, people on vacation, the heat and humidity slowing us down. And the drone of those summer cicadas hypnotize us into complacency. We are aware that there is hurt and pain in the world, but during the summer, we mute the news more; we reach out less. Perhaps we focus too much inwardly, trying to escape the impending cacophony that happens in the autumn for just a few more weeks, just a few more days, just a few more hours. And suddenly—there’s that sound of the shofar! When we hear it, do we simply hear the sound and acknowledge the passing of time alone? Or do we hear its call? Its demand? Do we wake up? Do we face the ugliness and difficulty in our lives? Does it stir within us the spirit to rise to the challenge of the Holy Days to come? Or do we chose to not face that reality? I’m reminded of that ugly insect making that lulling song. I’m fine hearing it. It’s peaceful, mantra-like. And then the reality of it, of the point of the song, is jarring. All the more so should the shofar not become a relic of a sound, but rather a real alarm! The shofar says, “Wake up from your (moral) sleep. You are asleep. Get up from your slumber. You are in a deep sleep. Search for your behavior. Become the best person you can. Remember God, the One Who created you.” Mishneh Torah, Laws of Repentance 3:4. Rosh Hashanah and Yom Kippur are only single days. But we have the gift of an entire month—this month of Elul—through which we can explore, contemplate, reflect, and act, so that the Holiest season for the Jew doesn’t become an afterthought. The ideas and prayers of those days are so huge, so filled with awe, that to come unprepared can riddle us with guilt, with fear, with dread. In fact, all those words are used in the liturgy of those days! And we should have fear and dread when our souls are so asleep that we don’t recognize when we cause pain in others, or when we become so stubborn or narrow-minded that we cannot change ourselves for the better. Lest I paint a picture of an unattainable goal, bear this in mind. The Rabbis teach that the name of the month of Elul, spelled “Aleph – Lamed – Vav – Lamed” is an acronym for a verse from the Song of Songs: “Ani L’dodi v’dodi li” — “I am my beloved’s and my beloved is mine.” Many believe the biblical love poetry of the Song of Songs to be a metaphor for the love between the Divine and humanity. It reminds us that we do not struggle alone—that when the shofar calls us to action, we do not have to face our duty without help or encouragement. If we embrace our charge and respond to the call of the shofar, we do so with the comfort provided by Divinely derived strength and hope. If we turn our hearts towards the One, then we will more easily be inclined towards forgiveness, towards acceptance, and towards wholeness. There are still a few weeks left of August, and we desperately want to cling to, as Nat King Cole sang so very well, those “lazy hazy crazy days of summer.” But as we have entered Elul, we have a renewed responsibility. Our days on this earth are so few, and we must make them all count. And as we are counting down to the New Year around the corner, we pray that our very being resonates with the sound of the shofar. May this season of Elul be for all here, for all in our community, and for all whose hearts and minds are opened or can be opened, a time of healing and hope. May we answer the call towards self-improvement. May we see this moment not as a time to be complacent but a time for action. And may we all know that when we are weary and not up to the task this day, that we have our family, our friends, and our community to turn to to help us towards that important end—to greeting the New Year of 5770 knowing that we have done our part and will continue to do our part of making the world a bit more whole. May we all have a pleasant end to our summer, but may we also embrace the challenge Elul gives us with full hearts.